I like to make money, though I doubt I’ll ever be a dot.com zillionaire. I have too much of a writer/artist’s heart (whatever that is), and am much more interested that certain details of a graphic are correct, than I am if one of my licensed t-shirts is displayed properly (though I do appreciate the importance of that part of business too). Let me reword that. I don’t like selling things. I probably am fairly good at selling things (for instance I’m fairly good at bartering which takes a certain amount of sales acumen), and by the same token I understand the importance of the myriad of details that go into an entrepreneurial venture. I have learned over the years that I have strengths in some areas and weaknesses in others. There are several remedies for that. In the areas of weakness, I should surround myself with people who have strengths in those areas, and be the strength for them, if they have weaknesses in the areas (of which I have strength). It’s business but it’s also physics. In basic physics one of the first lessons is “action/reaction”. What people don’t understand is those physics apply to everything. When we empower someone, we become empowered. When we try to undermine or hurt someone, we become disempowered. Don’t believe me? Try it. It never fails to be true. So I try my best to try to empower those around me. I don’t do it perfectly, but that’s no reason not to keep trying. And I allow them to empower me, if they have knowledge in a matter of which I do not. Which brings us to border collies and investments. Rumor has it that art and art collectibles have outperformed Standard & Poors for the past 3 decades. That really doesn’t surprise me much, given the reasons people buy art or collectibles compared to the reasons people buy stocks. I love art and photography collectibles and my wife Lee Hiller (Lee Hiller-London) who is a fine nature photographer and I have posters and prints of our work all over our home. We have some mugs, cards etc. too. We may, or may not ever sell them, but whatever we do, we’ll enjoy them, and have enjoyed them as the years have passed. We had several new ones to our collection each year. Our wall looks like a nicely stocked gallery. One could do that with their stock certificates (if they wished) but the emotions that stocks and bonds paperwork seem to enhance are not in the same league with arts and letters collectibles on a print, mug, apron or even ornament. That’s why I don’t “just design a T-shirt when we create a cartoon but a bulk of collectibles, because a lot of people are like me. They often don’t just want a T-shirt or an eco-friendly bag or a mug bearing that image, they want all three and maybe a key chain and/or button to match. Which brings us to border collies. I love all dogs. But late in life I shared my home with a beautiful bearded collie mix (I think); and learned about a whole new breed. Most my life I’d had hounds, mixes, goldens labs etc. One of my best friends had a border collie who reminded me very much of my bearded collie in many ways. Both were extremely bright, a bit hyper, goofy and a lot of fun. My friend was/is also a sculpture. He has made numerous sculpted metal of border collies which are wonderful. I’ve not kept up with Frank for several years (his late dad was one of my best friends though), but it gave me the idea of collectibles. If it worked so well on “serious items”, why couldn’t it work with cartoon collectibles? So I created products, and put them in specific categories and pages, so that one could find a tee, keep shopping for the same design on other products, and not get lost. Here is a “for instance” of my border collie page at one of my online shops. Enjoy and have a great week. Rick London is a writer, cartoonist, songwriter and designer. 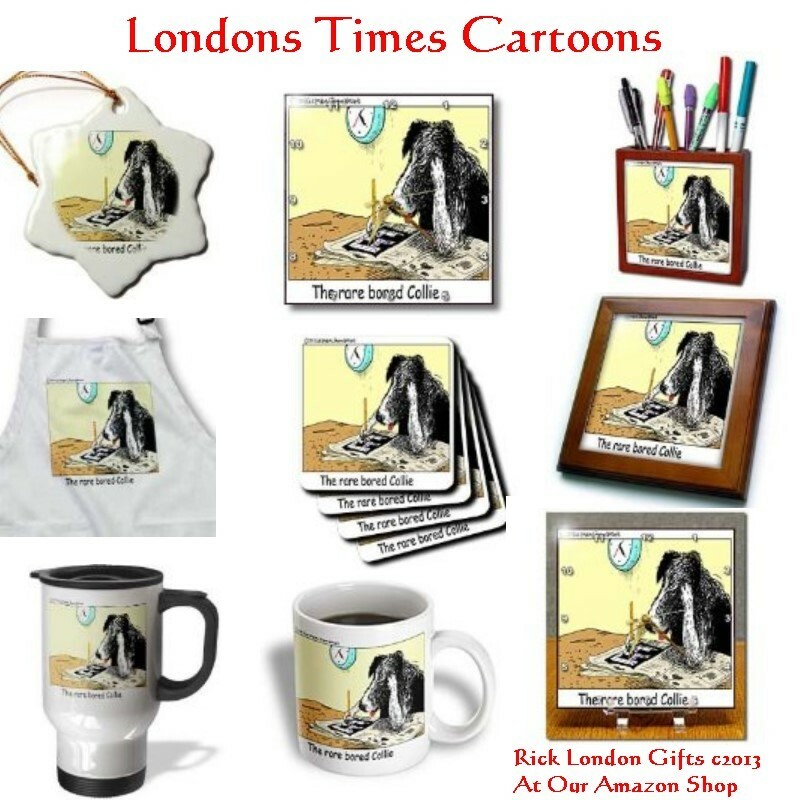 He is best known for Google #1 ranked Londons Times Offbeat Cartoons & Funny Gifts which he launched in 1997 in an abandoned tin shed in rural Ms.